Definition at line 1832 of file btrfs_drv.h. Definition at line 354 of file winternl.h. Definition at line 264 of file ntddk_ex.h. Referenced by LdrpInitializeProcess(), and MmCreatePeb(). Definition at line 349 of file winternl.h. Referenced by get_shiminfo(), and SeiInit(). Definition at line 350 of file winternl.h. Definition at line 352 of file winternl.h. Referenced by get_shiminfo(), and LdrpInitializeProcess(). Definition at line 131 of file winternl.h. Definition at line 136 of file winternl.h. Definition at line 241 of file ntddk_ex.h. Definition at line 1834 of file btrfs_drv.h. Referenced by LdrpInitializeProcess(), LdrpRunInitializeRoutines(), MmCreatePeb(), and START_TEST(). Definition at line 274 of file ntddk_ex.h. Definition at line 353 of file winternl.h. Referenced by LdrpInitializeProcess(), and RtlGetVersion(). Definition at line 253 of file ntddk_ex.h. Definition at line 256 of file ntddk_ex.h. Definition at line 255 of file ntddk_ex.h. Definition at line 250 of file ntddk_ex.h. Referenced by LdrpInitializeProcess(), RtlAcquirePebLock(), and RtlReleasePebLock(). Definition at line 305 of file winternl.h. Definition at line 251 of file ntddk_ex.h. Definition at line 252 of file ntddk_ex.h. Definition at line 361 of file winternl.h. Referenced by FlsAlloc(), FlsFree(), and LdrpInitializeProcess(). Definition at line 362 of file winternl.h. Definition at line 359 of file winternl.h. Referenced by FlsAlloc(), and FlsFree(). Definition at line 360 of file winternl.h. Definition at line 257 of file ntddk_ex.h. Definition at line 311 of file winternl.h. Definition at line 294 of file ntddk_ex.h. Definition at line 308 of file ntddk_ex.h. Definition at line 343 of file winternl.h. Definition at line 292 of file ntddk_ex.h. Referenced by GdiQueryTable(), and MyGdiQueryTable(). Definition at line 278 of file ntddk_ex.h. Referenced by MmCreatePeb(), and RtlpSetHeapParameters(). Definition at line 327 of file winternl.h. Definition at line 277 of file ntddk_ex.h. Definition at line 326 of file winternl.h. Definition at line 276 of file ntddk_ex.h. Definition at line 325 of file winternl.h. Definition at line 275 of file ntddk_ex.h. Definition at line 324 of file winternl.h. Definition at line 245 of file ntddk_ex.h. Referenced by FindModule(), GetModuleHandleA(), GetProcessVersion(), LdrpInitializeProcess(), LdrpInitializeThread(), LdrpMapDll(), LdrShutdownProcess(), LdrShutdownThread(), MmCreatePeb(), SeiInit(), and UserpGetClientFileName(). Definition at line 300 of file winternl.h. Definition at line 307 of file ntddk_ex.h. Definition at line 304 of file ntddk_ex.h. Referenced by IsConsoleProcess(), and MmCreatePeb(). Definition at line 339 of file winternl.h. Definition at line 305 of file ntddk_ex.h. Referenced by CreateProcessInternalW(), and MmCreatePeb(). Definition at line 340 of file winternl.h. Definition at line 306 of file ntddk_ex.h. Definition at line 341 of file winternl.h. Definition at line 239 of file ntddk_ex.h. Referenced by LdrpInit(), and MmCreatePeb(). Definition at line 254 of file ntddk_ex.h. Definition at line 1837 of file btrfs_drv.h. Referenced by DbgkpPostFakeModuleMessages(), EnumProcessModules(), FindModule(), GetModuleFileNameW(), InitExeName(), KiPrepareUserDebugData(), LdrpHandleOneNewFormatImportDescriptor(), LdrpHandleOneOldFormatImportDescriptor(), LdrpInit(), LdrpInitializeProcess(), LdrpInitializeThread(), LdrpLoadDll(), LdrpLoadImportModule(), LdrpMapDll(), LdrpRunInitializeRoutines(), LdrShutdownProcess(), LdrShutdownThread(), LdrUnloadDll(), lie_about_fs_type(), ListUserModules(), PsaEnumerateProcessModules(), RtlpQueryRemoteProcessModules(), and UserpGetClientFileName(). Definition at line 301 of file winternl.h. Definition at line 295 of file ntddk_ex.h. Referenced by LdrpInit(), LdrUnloadDll(), and wined3d_cs_create(). Definition at line 287 of file ntddk_ex.h. Referenced by MmCreatePeb(), and RtlpAddHeapToProcessList(). Definition at line 358 of file winternl.h. Referenced by LdrpInit(), LdrpInitializeExecutionOptions(), and MmCreatePeb(). Definition at line 243 of file ntddk_ex.h. Definition at line 270 of file ntddk_ex.h. Referenced by LdrpInitializeApplicationVerifierPackage(), LdrpInitializeExecutionOptions(), LdrpInitializeProcess(), LdrpWalkImportDescriptor(), LdrUnloadDll(), MiCheckForUserStackOverflow(), MmCreatePeb(), and RtlGetNtGlobalFlags(). Definition at line 286 of file ntddk_ex.h. Referenced by RtlInitializeHeapManager(), RtlpAddHeapToProcessList(), and RtlpRemoveHeapFromProcessList(). Definition at line 269 of file ntddk_ex.h. Definition at line 265 of file ntddk_ex.h. Definition at line 302 of file ntddk_ex.h. Referenced by GetVersion(), MmCreatePeb(), RtlGetNtVersionNumbers(), and RtlGetVersion(). Definition at line 300 of file ntddk_ex.h. Referenced by GetVersion(), hash_basename(), MmCreatePeb(), RtlGetNtVersionNumbers(), RtlGetVersion(), and START_TEST(). Definition at line 301 of file ntddk_ex.h. Definition at line 303 of file ntddk_ex.h. Referenced by GetVersion(), MmCreatePeb(), and RtlGetVersion(). Definition at line 345 of file winternl.h. Definition at line 1841 of file btrfs_drv.h. Referenced by LdrpInitializeProcess(), and START_TEST(). Definition at line 355 of file winternl.h. Definition at line 249 of file ntddk_ex.h. Referenced by LdrpInitializeProcess(), LdrpInitializeProcessCompat(), NtProcessStartup(), and RtlDebugDestroyHeap(). Definition at line 304 of file winternl.h. Definition at line 288 of file ntddk_ex.h. Referenced by MmCreatePeb(), RtlpAddHeapToProcessList(), and RtlpRemoveHeapFromProcessList(). Definition at line 247 of file ntddk_ex.h. Definition at line 302 of file winternl.h. Definition at line 1838 of file btrfs_drv.h. 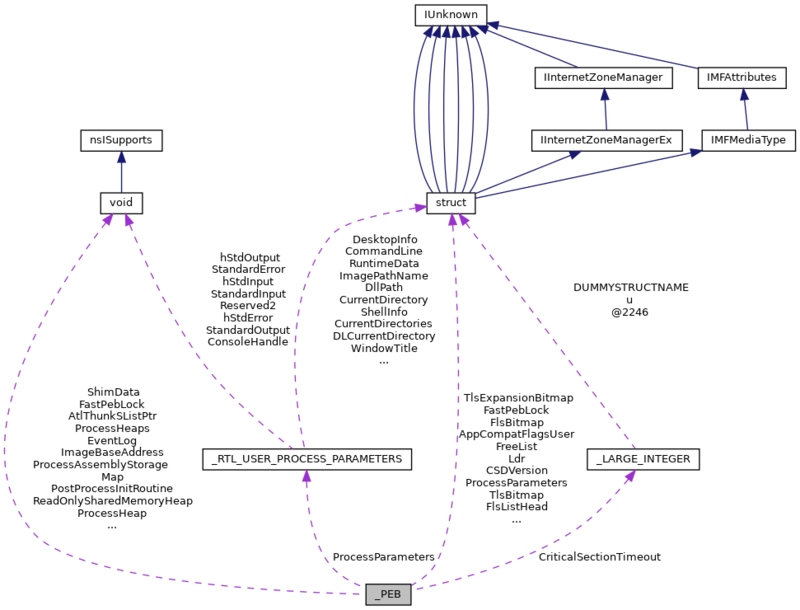 Referenced by BasePushProcessParameters(), CreateProcessInternalW(), InitExeName(), InitThreadCallback(), KsecGatherEntropyData(), LdrpInitFailure(), LdrpInitializeProcess(), LdrpRunInitializeRoutines(), NtProcessStartup(), RtlComputePrivatizedDllName_U(), RtlpInitEnvironment(), RtlQueryEnvironmentVariable_U(), SeiInit(), test_RemoveDirectoryA(), and test_RemoveDirectoryW(). Definition at line 293 of file ntddk_ex.h. Definition at line 240 of file ntddk_ex.h. Definition at line 261 of file ntddk_ex.h. Definition at line 262 of file ntddk_ex.h. Definition at line 263 of file ntddk_ex.h. Referenced by CsrSrvCreateSharedSection(), and DllMain(). Definition at line 310 of file winternl.h. Definition at line 1833 of file btrfs_drv.h. Definition at line 138 of file winternl.h. Definition at line 140 of file winternl.h. Definition at line 141 of file winternl.h. Definition at line 1835 of file btrfs_drv.h. Definition at line 1836 of file btrfs_drv.h. Definition at line 130 of file winternl.h. Definition at line 1839 of file btrfs_drv.h. Definition at line 1840 of file btrfs_drv.h. Definition at line 133 of file winternl.h. Definition at line 1842 of file btrfs_drv.h. Definition at line 1843 of file btrfs_drv.h. Definition at line 135 of file winternl.h. Definition at line 137 of file winternl.h. Definition at line 1844 of file btrfs_drv.h. Referenced by DllMain(), get_base_dir(), MmCreatePeb(), test_query_object(), and UserCreateWinstaDirectory(). Definition at line 351 of file winternl.h. Definition at line 242 of file ntddk_ex.h. Definition at line 248 of file ntddk_ex.h. Definition at line 357 of file winternl.h. Definition at line 356 of file winternl.h. Definition at line 259 of file ntddk_ex.h. Referenced by LdrpInitializeProcess(), TlsAlloc(), and TlsFree(). Definition at line 313 of file winternl.h. Definition at line 260 of file ntddk_ex.h. Definition at line 346 of file winternl.h. Definition at line 347 of file winternl.h. Definition at line 258 of file ntddk_ex.h. Definition at line 266 of file ntddk_ex.h. Definition at line 344 of file winternl.h.